Rashan Gary would fit in nicely in the Eagles' defense. The college football season is in full swing, as we are now into the seventh week of a full slate of games. Jerry Tillery, DT, Notre Dame (6'7, 305): Pittsburg at (5) Notre Dame, 2:30 p.m. In six games in a breakout season so far in 2018, Tillery already has 7 sacks and 3 forced fumbles from his defensive tackle spot. Four of those came in a win over Stanford in which Tillery got pressure all game, even when he didn't get home. With Timmy Jernigan out, the defensive tackle spot opposite Fletcher Cox has been a glaring hole in the Eagles' defense. Haloti Ngata is still a capable run-stuffer, which is fine situationally, but when opposing offenses are passing on first down with him in the game, it's basically a wasted lineman who isn't getting pressure. Ngata aside, the rest of the D-tackles on the Birds' roster are just bodies. Tillery would give the Eagles a big body on the interior who can also get pressure up the middle. Darrell Henderson, RB, Memphis (5'9, 200): (10) UCF at Memphis, 3:30 p.m.
Henderson's yards per carry numbers are absurd. In 2017, he ran 130 times for 1154 yards (8.9 YPC) and 9 TDs. In six games so far in 2018, he has 79 carries for 934 yards (11.8 YPC!) and 12 TDs. As an added bonus, Henderson is a good receiver out of the backfield, as he has 53 catches in a little over two seasons at Memphis. Mecole Hardman, WR, Georgia (5'11, 183): (2) Georgia at (13) LSU, 3:30 p.m. The Eagles don't have any long-term options at returner. Hardman could be that, plus a versatile threat with speed in the regular offense. Taylor Rapp, S, Washington (6'0, 200): (7) Washington at (17) Oregon, 3:30 p.m. The Eagles have a bigger need at the deep middle safety spot in Jim Schwartz's defense with Rodney McLeod out, but they would also be wise to have a safety in the pipeline who handle a number of responsibilities, the way that Malcolm Jenkins has in Philly the last five years. Rapp is that kind of all-around good player who tackles well, makes plays on the football, and can move around from one position to the next. In the highlight reel below, what stands out to me is his ability as a pass rusher. He's dipping and bending around the edge like a polished defensive end on one sack, and he exposes a 300-plus pound right tackle in space on another. He's just a savvy football player who you can leave on the field for the entirety of the game. 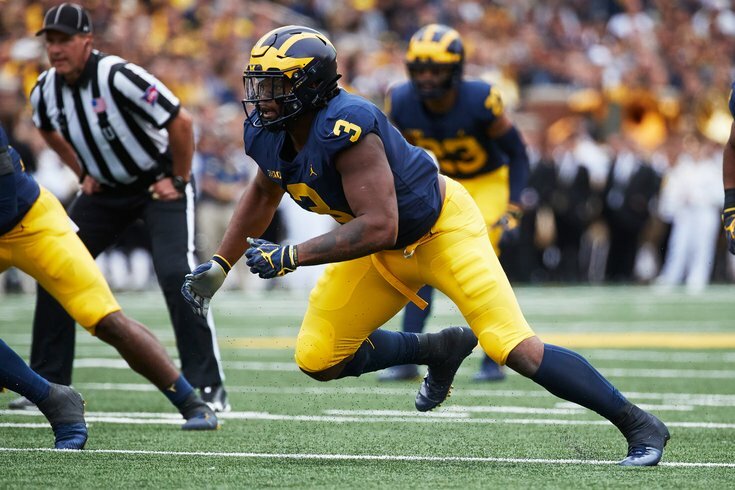 Rashan Gary, DE, Michigan (6'5, 283): (15) Wisconsin at (12) Michigan, 7:30 p.m.
Gary's fit on the Eagles' defense could be in something of a Michael Bennett role, where he can play defensive end, but also move inside on obvious passing downs.